Home | New Releases | Alex Ross Limited Edition Fine Art Giclee Print on Canvas:"Marvelocity: Spider-Man"
Alex Ross Limited Edition Fine Art Giclee Print on Canvas:"Marvelocity: Spider-Man"
About the Art: "This dynamic illustration is from the long-awaited Marvel Comics retrospective art book, Marvelocity, by Alex Ross and writer Chip Kidd. Included in the book are more than 50 never-been-published sketches, paintings, photographs, working models, preparatory art, and a 14-panel portfolio gallery of Marvel's most beloved characters! With each depiction Ross brings the Marvel Universe to life like never before and offers up a triumphant celebration of these iconic characters: Spider-Man, Iron Man, Captain America, Black Panther, the Avengers, Doctor Strange, Ms Marvel, Guardians of the Galaxy, X-Men and more! "Marvelocity: Spider-Man" is part of a series of prints featuring artwork from the new Marvelocity book. The first 4 images include Captain America, Spider-Man, Iron Man, and Doctor Strange. Editions 1-50 and AP/PPs 1-15 are reserved as matched sets. Each print is signed by Alex Ross. If you purchase Capt. America, Spider-Man, and Iron Man you get Doctor Strange at no charge. Purchase the Set of 4 for a reduced SRP of $2475. 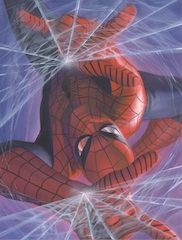 Home | Disney and Animation Art | Alex Ross | Super Hero Animation Art | Alex Ross Limited Edition Fine Art Giclee Print on Canvas:"Marvelocity: Spider-Man"